Urinary reflux is a condition that is usually diagnosed in childhood. It means urine is flowing back from your bladder into your kidneys. The main job of kidneys is to filter your blood and remove waste and unwanted water. The waste and unwanted water becomes urine, which travels through tubes called ureters to your bladder. It stays in your bladder, before it is passed out of your body through a tube called your urethra. there's a blockage in their urinary system. A child with urinary reflux is more likely to get urinary tract infections (UTIs), and these can cause kidney damage if they're not treated. This is called reflux nephropathy (nef-roh-path-y), and as a result their kidneys can't work as well as they should. What are the symptoms of urinary reflux? Urinary reflux is usually diagnosed with an ultrasound scan, which looks at the size of the child's kidneys to see if there is any swelling. Sometimes it shows up before birth, on a routine pregnancy ultrasound. 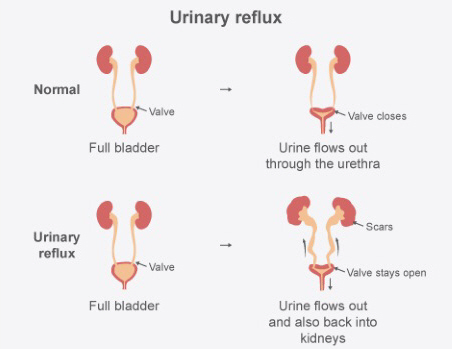 How is urinary reflux treated? Children with urinary reflux usually take antibiotics to clear any urinary infection. Very occasionally they may have an operation to mend their ureter valves, and stop urine from flowing back into their kidneys. Usually, reflux gets better with age and there are no long-term complications. If there is scarring, it is usually minor, and doesn't cause any long-term problems.